P.O. Box: 15215, Dammam 31444, Saudi Arabia. Management of patients with multiple myeloma having several coexisting comorbid medical conditions is a real challenge as complications related to the primary disease, its treatment and other comorbidities are prone to occur. In such complicated cases, an individualized therapy has to be adopted. A 45 year old male, with pre-existing end-stage renal disease, diabetes mellitus and hypertension, was diagnosed to have multiple myeloma in October 2012 at King Fahad Specialist Hospital in Dammam, Saudi Arabia. The diagnosis of diabetes was made one year prior to the diagnosis of his myeloma and he was receiving 40 to 50 units of insulin per day to control his diabetes. After receiving 4 cycles of bortezomib, lenalidomide and dexamethasone, his myeloma was controlled then in March 2013, an autologous hematopoietic stem cell transplantation was performed. One month following his autograft, his insulin requirements started to decrease gradually and 4 months post-transplantation his diabetes became insulin independent. For more than 4 years after his stem cell transplantation, both his diabetes and multiple myeloma are still under control. To our knowledge, this is the first world report of diabetes mellitus cured by stem cell therapy performed to control a hematologic malignancy. Multiple myeloma (MM) is a clonal plasma cell malignancy that accounts for 1% of all cancers and 10% of hematologic malignancies [1-3]. The diagnosis of MM requires: (1) ≥ 10% clonal bone marrow (BM) plasma cells or biopsy-proven plasmacytoma, and (2) evidence of ≥ 1 MM defining events: evidence of endorgan damage such as hypercalcemia, anemia, lytic bone lesions and renal insufficiency (RI); BM clonal plasma cells ≥ 60%; serum involved: uninvolved free light chain ratio ≥ 100 and > one focal lesion on magnetic resonance imaging [1,3,4]. Patients with MM having RI can be treated with triplet combinations using either bortezomib- or thalidomide-based regimens [2,5-9]. Historically, patients with pre-existing chronic kidney disease have been excluded from hematopoietic stem cell transplantation (HSCT) which is a potentially lifesaving therapeutic modality [5,10,11]. However, high-dose chemotherapy (HDC) followed by HSCT is becoming more widely used in patients with comorbid medical conditions including those with RI . Additionally, there have been several reports in the literature describing successful not only autologous HSCT (auto-HSCT) but also allogeneic HSCT for patients with chronic kidney disorders including those with end-stage renal disease (ESRD) receiving hemodialysis . A 45 year old Saudi male, with preexisting diabetes mellitus (DM), hypertension and ESRD, was diagnosed to have MM, IgG lambda, stage III in October 2012 at King Fahad Specialist Hospital (KFSH) in Dammam. He presented with ÃÂ 60% clonal bone marrow (BM) plasma cells, anemia, ESRD, an elevated B2 microglobulin and bone lytic lesions but without any cytogenetic abnormality. His ESRD was diagnosed in June 2012 and he was commenced on regular hemodialysis. The diagnosis of DM was made in October 2011. For the first 6 months, he was receiving oral hypoglycemic agents without control of his blood glucose levels. After having one episode of diabetic ketoacidosis, he was shifted to insulin therapy. His daily insulin requirements were ranging between 40 and 50 units of insulin. His parents, one of his children and 4 of his siblings are known diabetics. For his MM, the patient received 4 cycles of bortezomib, lenalidomide and dexamethasone (VRD) regimen, the last cycle was started in late January 2013. Restaging evaluation of his myeloma showed excellent biochemical responses and decrease in BM monoclonal plasma cells to ÃÂ10%. Thereafter, the patient was prepared for auto-HSCT so he underwent stem cell mobilization with cyclophosphamide and granulocyte-colony stimulating factor (G-CSF). Peripheral blood stem cell collection was performed by apheresis on the 10th and 11th of March 2013 and the total number of CD34+ stem cells collected was 8.62×106/kilogram (kg) body weight. On 12/03/2013, the patient was planned for high-dose melphalan, but the conditioning therapy was postponed as the patient was febrile and having clinical evidence of sepsis. He received a course of intravenous antimicrobials and after control of his sepsis, he received a melphalan dose of 140 mg/m2 on the 19th of March 2013. One day later, he had the autologous stem cell infusion. Post-HSCT, the patient developed the following complications: (1) grade III mucositis treated with morphine infusion, (2) jerky movement of the limbs controlled by benzodiazepines, (3) cytomegalovirus infection treated with valacyclovir, and (4) pulmonary tuberculosis (TB) treated initially with 4 then with 2 anti-TB drugs for a total duration of 12 months. Nevertheless, he engrafted his neutrophils on day 14 and his platelets on day 19 post-HSCT. One month after his auto-HSCT, the patient was noted to have hypoglycemic episodes requiring frequent adjustments of his insulin therapy. Subsequently, his insulin therapy was tapered gradually till it was stopped altogether 3 months later. Repeated fasting and random blood glucose evaluation showed normal blood glucose levels so no more insulin therapy was administered. Subsequently, the patient remained dialysis-dependent for his ESRD, but no new infectious complication was encountered. Restaging evaluation of his MM 3 month post-transplantation showed continued biochemical control of his myeloma and decrease in the BM monoclonal plasma cells to ÃÂ5%. Neither consolidation nor maintenance therapy was required for his primary disease. During his subsequent follow up, no new treatment was prescribed for either DM or MM. He was last seen at our outpatient clinic on 22/05/2017. He had no new complaints and his physical examination revealed no new abnormality. His laboratory evaluation showed normal blood counts and biochemical profile apart from elevated serum creatinine due to his ESRD. His fating blood glucose was 5.1 mmol/L and his hemoglobin A1C was 4.8%. No new medication was prescribed and a new appointment was scheduled. As the patient is on the waiting list for cadaveric kidney transplantation, the following will be taken into consideration in case of having a renal allograft: close follow up for his MM, bortezomib maintenance therapy and infection prophylaxis including isoniazid. The therapeutic strategies of MM have changed dramatically over the past decade mainly due to the incorporation of novel therapies; namely bortezomib, thalidomide and lenalidomide; into the frontline treatment of MM as these agents have improved the survival of patients treated with chemotherapy alone [12-15]. Several studies have shown that VRD regimen is well tolerated and highly effective in the treatment of newly diagnosed MM [16-21]. The new novel drugs that include: (1) new immunomodulatory agents such as pomalidomide, (2) next generation proteasome inhibitors such as carfilzomib and ixazomib, (3) histone acetylase inhibitors such as panobinosta, and (4) monoclonal antibodies such as daratumomab and elotuzumab have already shown promising results in the treatment of MM patients [5,22]. Compared to conventional chemotherapy alone, HDC followed by auto-HSCT had been shown to improve the depth of response and prolong progression-free survival (PFS) and overall survival (OS) [12,13,23,24]. Hence, HDC followed by auto-HSCT, performed early in the course of the disease or at the time of relapse, has become the standard of care for patients with MM younger than 65 years of age [16-18,24]. Eligibility for HSCT is determined by age, performance status and presence as well as severity of certain comorbid medical conditions . However; age, performance status and renal dysfunction are not exclusion criteria to safe transplantation, but frailty of the patient is a major determinant of eligibility for HSCT . For candidates of auto-HSCT with normal renal function the standard conditioning therapy is high-dose melphalan 200 mg/m2, whereas for patients having serum creatinine ÃÂ2 mg/dL, the dose of melphalan should be reduced to 140 mg/m2 [5,12]. Studies have shown that in adult patients with MM, VRD regimen followed by auto-HSCT has been associated with significantly longer PFS but not OS compared to VRD alone and that auto-HSCT with VRD induction and consolidation followed by lenalidomide maintenance has produced high-quality responses and favorable tolerability in patients with newly diagnosed MM [16,18,22]. However, the only potentially curative therapeutic intervention for MM is allogeneic HSCT, but at the expense of high therapy-related mortality (TRM) . In patients with MM, the causes of RI include: myeloma cast nephropathy which is the commonest cause, excess of monoclonal free light chains causing proximal renal tubular damage, dehydration, infectious complications, hypercalcemia, hyperuricemia, use of nephrotoxic drugs and contrast media, hyperviscosity, myeloma cell infiltration and amyloid deposition [5-8,11]. RI is one of the most common complications of MM [5,7,8,11,25]. Between 20% and 50% of patients with newly diagnosed MM present with RI while 40-50% of patients develop RI during the course of the disease [5,7,8]. Also, up to 20% of newly diagnosed patients with MM have renal failure (RF) with serum creatinine ÃÂ2 mg/dL and about 5% of myeloma patients have dialysis-dependent RF at presentation [5,11]. Currently, bortezomib and dexamethasone triplet combinations are the standard therapy for patients with MM having RI as they have been associated with high response rates and recovery of renal function [5-8,25]. Thalidomide and lenalidomide can also be considered for patients who cannot receive bortezomib and their use has been shown to cause significant improvement in renal function . In early chemotherapy trials: RF was considered a predictor of poor prognosis, patients with hemodialysis were reported to have a poorer prognosis, and RF was considered a marker of high tumor burden and inadequate therapy . Also, patients with MM having RI were considered ineligible for auto- HSCT because of the concerns about higher rates of treatmentrelated toxicity and non-relapse mortality (NRM), mainly due to mucositis, infectious complications and encephalopathy [5,11]. Recent studies have shown that auto-HSCT in patients with MM and RF has been associated with partial or complete recovery of renal function even in dialysis-dependent patients . Therefore, auto-HSCT can be offered to patients with MM and RF with acceptable toxicity and NRM and a significant improvement in renal function in one third of these patients [5,11]. In patients with MM and RF, a melphalan dose of 200 mg/m2 can be administered in the conditioning therapy of auto-HSCT without an increase in toxicity and NRM . There are 2 types of stem cells in the BM: hematopietic stem cells (HSCs) and mesenchymal stem cells (MSCs) . MSCs are multipotent, non-hematopoietic, stromal or progenitor cells that are capable of differentiating into multiple lineages or various cell types belonging to the mesoderm germ layer including adipocytes, osteocytes and chondrocytes [27-29]. Sources of MSCs include: BM which is the richest source, peripheral blood, umbilical cord blood (UCB) and placenta, endometrium and menstrual blood, adipose tissue, skeletal muscle and dental pulp [26,29-39]. Studies have shown that MSCs express the following surface markers: CD 73, CD 90, CD 105, CD 106, CD 146, CD 10, CD 13, CD 9, CD 26, CD 28, CD 33, CD 44, CD 49a, CD 49b, CD 71, CD 164, CD 166, CD 271, human leucocyte antigen (HLA)- class 1, Stro-1, SSEA-4 and ITGA11 and they lack the expression of: CD34, CD 45, CD 14 or CD 11b, CD79a or CD19, CD31 and HLADR [27,28,35,40,41]. The international society of cellular therapy has established the following minimal criteria to define human MSCs: (1) MSCs must be plastic-adherent when maintained in standard culture conditions, (2) expression of the following surface markers: CD73, CD 90 and CD105 and lack of expression of: CD34, CD 45, CD 14 or CD11b, CD79a or CD19 and HLA-DR, and (3) ability to differentiate into osteoblasts, adipocytes and chondrocytes [29,32,33,42]. However, several studies have shown that MSCs; obtained from BM, adipose tissue and other sources; do express CD 34 surface marker [37,43-45]. Also, several studies have revealed that growth factors such as G-CSF can mobilize not only HSCs but also MSCs from the BM into the peripheral blood in order for these stem cells to be harvested by apheresis [36,38]. In comparison to the utilization of BM, the use of mobilized peripheral blood stem cells is the method of choice for the following reasons: (1) increased production of HSCs and progenitor cells, (2) shorter time period required for a satisfactory repopulation of the BM after stem cell infusion, (3) faster engraftment with more rapid recovery of neutrophils and platelets, (4) few platelet and packed red blood cell transfusions, (5) faster lymphocyte reconstitution, (6) fewer febrile reactions, (7) fewer regimenrelated morbidity and mortality with less pain and lower risk to patients, and (8) fewer technical difficulties [36,46]. The agents that are used in the peripheral blood progenitor cell mobilization include: growth factors such as G-CSF, cyclophosphamide in combination with G-CSF, and plerixafor (CXCR4, chemokine receptor type-4 inhibitor) which is used to increase the yield of stem cell collections in patients experiencing poor mobilization [47-50]. However, G-CSF is the predominant stem cell mobilizer used clinically . Poor mobilization occurs in up to 25% of patients and it has the following risk factors: lymphoma or MM as the primary illness, heavily pre-treated cancer patients with chemotherapy ± radiotherapy, genetic diseases such as Fanconi anemia, poor BM reserve due to low cellularity, old age, low baseline CD34+ cell count prior to apheresis and low platelet count before mobilization [36,46]. As mobilized peripheral blood progenitor cells are the main sources for auto-HSCT, collection of adequate number these cells is a critical step in the auto-HSCT setting . The goal of CD34+ cell mobilization is to collect enough cells to achieve a rapid and sustained hematopoietic recovery after HDC, since delayed hematopoietic recovery is associated with increased toxicity and TRM . Stem cell doses ÃÂ2 × 106/kilogram (kg) body weight of the recipient are associated with slower hematopoietic recovery and worse outcome . The presence of circulating MSCs in animal models is well established . Also, studies have shown their presence in fetal and neonatal circulation . Initially, there was controversy regarding the presence of MSCs in the circulation of human adults and there was an impression that BM-derived MSCs or stromal progenitor cells cannot be recovered from peripheral blood progenitor cell collections obtained from healthy donors or patients who underwent peripheral stem cell collections after mobilization [51,53-55]. Later on studies have shown the following: (1) presence of small numbers of MSCs in the peripheral blood of adults in the steady state, (2) MSCs can be isolated from peripheral blood during stem cell collections or in the presence of trauma or inflammation, and (3) not only presence of MSCs among mobilized peripheral blood stem cells in the circulation but also their migration to the BM in order for them engraft at a later stage [53,56-59]. Other studies have also shown that HSCs and progenitor cells are mobilized from the BM into the peripheral blood under the following circumstances: stem cell mobilization using chemotherapeutic agents or growth factors, tissue injuries or trauma, hypoxia, stroke and inflammatory conditions [46,52,57-60]. Successful transplantation of HSCs and progenitor cells is based on their ability to home to the BM and on their engraftment capacity . Homing of HSCs and progenitor cells is a rapid process that takes place during the hours following stem cell infusion and is an essential requirement for repopulation and engraftment . In patients with DM, mobilization of HSCs is impaired when G-CSF is used in the mobilization protocols [61-64]. The use of plerixafor in the mobilization protocols overcomes the impaired HSC mobilization caused by hyperglycemia in patients with DM [61,64]. Also, studies have shown that: (1) BM-derived MSCs are better tolerated and more effective than BM-mononuclear cells for increasing limb perfusion and promoting healing of foot ulcers in patients with DM and critical limb ischemia, and (2) the success of cellular therapy is independent of the number of MSCs present in the BM aspirate used in autologous stem cell therapy [65,66]. Hyperglycemia, DM and metabolic syndrome are well known complications of HSCT particularly the allogeneic forms [67-69]. In recipients of HSCT, hyperglycemia and uncontrolled DM have been reported to be associated with an adverse outcome as they contribute to early and higher morbidity and mortality mainly due to infectious complications [69,70]. There have been several reports on transient resolution or even complete remission of psoriasis and other autoimmune disorders (AIDs) such as rheumatoid arthritis following either auto-HSCT or allogeneic transplantation performed for patients with various malignant hematological diseases [71-74]. Recently, considerable advances have been made in our understanding of the immunology of AIDs and their treatment with HSCT . Several animal studies and human clinical trials have provided convincing evidence that following HSCT, the immune system is normalized or reset . More than 3000 HSCT procedures for severe AIDs have been performed worldwide and the published clinical trials that included sufficient follow-up have demonstrated safety and efficacy of HSCT for AIDs [75,76]. However, the most beneficial effects of stem cell therapies in AIDs are those performed for severe refractory AIDs, particularly systemic sclerosis where a randomized clinical trial has shown significant long-term PFS benefit of HSCT [75-77]. DM affects millions of people worldwide and is associated with serious complications that affect all body organs [78-80]. The available therapeutic modalities for DM include: diet and lifestyle modifications, oral hypoglycemic agents, insulin injections and islet cell transplantation [79,81,82]. The efficacy of auto- HSCT for type 1 DM was first reported in the year 2007 . Since then, several studies have confirmed not only the safety but also the efficacy of this procedure in both types of DM [83-86]. The combination of high-dose immunosuppressive therapy and HSC infusions function synergistically to: downregulate the autoreactive T-cells, renew the immune system and improve the immune regulatory networks. Also, this combination has been shown to induce insulin independence in patients with type 1 DM [84-87]. Animal studies have suggested that embryonic stem cells (ESCs), induced pluripotent stem cells and MSCs can differentiate into insulin-producing cells and their use can ultimately lead to regulation of insulin secretion [78,85]. The increased C-peptide levels and the decreased HbA1C levels encountered in both animal and human trials have shown that stem cell therapies offer an effective and a promising treatment for type 1 and possibly type 2 DM [78,85]. Recent clinical trials in humans have utilized various stem cell therapies including: HSCs, UCB stem cells, ESCs and MSCs [78,80,85]. An open-label, phase I/phase II study using a technique called stem cell educator therapy has definitely proven the efficacy of human UCB-derived stem cells in simultaneously reversing autoimmunity via systemic and local immunomodulation and promoting islet β-cell regeneration . Also, a meta-analysis on the use of stem cell therapies in DM, published in 2016, came to the following conclusions: (1) stem cell therapies could represent a safe and an effective therapeutic modality in selected patients, particularly if applied early in the course of the disease, (2) the best outcome was achieved with CD34+ HSC therapies for type 1DM, and (3) UCB-derived MSCs provided significantly higher beneficial outcome than BMderived MSCs . Therefore, the era of cellular replacement therapy for DM has already begun as such therapies have shown that the application of these therapies to cure DM appears to be extremely promising [79,81]. However, despite being considered highly innovative therapeutic modalities, cellular therapies are still experimental and they should be performed only by highly experienced centers worldwide . Additionally, the combination of islet cell transplantation and stem cell therapeutics is another promising approach that may ultimately become curative for type 1 DM [81,89,90]. The patient presented had an advanced MM with several comorbid medical conditions that had significant impact on his management. Due to his severely impaired immunity, several infectious complications including bacterial sepsis, cytomegalovirus infection and pulmonary TB were encountered. Prompt treatment of these infections was translated into successful outcome. Cure of his DM can be explained by: (1) the effectiveness of auto-HSCT, regardless the indication, in controlling DM, and (2) the presence of large numbers of MSCs in the circulation on the day of transplantation due to the recent infections and due to the possible mobilization of these cells, together with HSCs, from the BM after cyclophosphamide and G-CSF. Not only the infused HSCs, but also these MSCs homed to the BM niche, then both cell populations engrafted and this ultimately lead to the cure of both DM and MM. In conclusion: the management of patients with MM having DM and ESRD should be tailored according to these comorbid medical conditions. Life-threatening complications that may be encountered should be treated appropriately. Considering a curative approach not only for MM, but also for DM and ESRD is a valid option for carefully selected patients. We are grateful to all medical, nursing and technical staff at KFSH in Dammam who participated in the management of the patient presented. Rajkumar S (2016) Multiple myeloma. 2016 update on diagnosis, risk-stratification, and management. Am J Hematol 91: 719-934. Palumbo A, Attal M, Roussel M (2011) Shifts in the therapeutic paradigm for patients newly diagnosed with multiple myeloma: maintenance therapy and overall survival. Clin Cancer Res 17: 1253-1263. Rajkumar SV, Kumar S (2016) Multiple myeloma: diagnosis and treatment. Mayo Clin Proc 91(1): 101-119. Rajkumar SV (2017) Overview of the management of multiple myeloma. Up To Date. Edited by Kyle RA, Connor RF. Yadav P1, Cook M2, Cockwell P1 (2016) Current Trends of Renal Impairment in Multiple Myeloma. Kidney Dis (Basel) 1: 241-257. Terpos E, Kleber M, Engelhardt M, Zweegman S, Gay F, Kastritis E, et al. (2015) European Myeloma Network. European Myeloma Network guidelines for the management of multiple myeloma-related complications. Haematologica 100: 1254-1266. Gaballa MR1, Laubach JP, Schlossman RL, Redman K, Noonan K, et al. (2012) Management of myeloma-associated renal dysfunction in the era of novel therapies. Expert Rev Hematol 5: 51-66. Gavriatopoulou M1, Terpos E1, Kastritis E1, Dimopoulos MA1 (2016) Current treatments for renal failure due to multiple myeloma. Expert Opin Pharmacother 17: 2165-2177. Kapoor P1, Ramakrishnan V, Rajkumar SV (2012) Bortezomib combination therapy in multiple myeloma. Semin Hematol 49: 228-242. Bodge MN, Reddy S, Thompson MS, Savani BN (2014) Preparative regimen dosing for hematopoietic stem cell transplantation in patients with chronic kidney disease: analysis of the literature and recommendations. Biol Blood Marrow Transplant 20: 908-919. Parikh GC, Amjad AI, Saliba RM, Kazmi SM, Khan ZU, et al (2009) Autologous hematopoietic stem cell transplantation may reverse renal failure in patients with multiple myeloma. Biol Blood Marrow Transplant 15: 812-816. Rajkumar SV (2017) Autologous hematopoietic stem cell transplantation in multiple myeloma. Up To Date. Edited by Negrin RS, Kyle RA, Connor RF. Quach H1, Joshua D, Ho J, Szer J, Spencer A, et al. (2015) Treatment of patients with multiple myeloma who are eligible for stem cell transplantation: position statement of the Myeloma Foundation of Australia Medical and Scientific Advisory Group. Intern Med J 45: 94-105. Shah N, Callander N, Ganguly S, Gul Z, Hamadani M, et al. (2016) American Society for Blood and Marrow Transplantation (2015) Hematopoietic Stem Cell Transplantation for Multiple Myeloma: Guidelines from the American Society for Blood and Marrow Transplantation. Biol Blood Marrow Transplant 21: 1155-1166. Mohty M, Harousseau JL (2014) Treatment of autologous stem cell transplant-eligible multiple myeloma patients: ten questions and answers. Haematologica 99: 408-416. Roussel M, Lauwers-Cances V, Robillard N, Hulin C, Leleu X, Benboubker L, et al. (2014) Front-line transplantation program with lenalidomide, bortezomib, and dexamethasone combination as induction and consolidation followed by lenalidomide maintenance in patients with multiple myeloma: a phase II study by the Intergroupe Francophone du Myélome. J Clin Oncol 32: 2712-277. Richardson PG, Weller E, Lonial S, Jakubowiak AJ, Jagannath S, et al. (2010) Lenalidomide, bortezomib, and dexamethasone combination therapy in patients with newly diagnosed multiple myeloma. Blood 116: 679-686. Attal M1, Lauwers-Cances V1, Hulin C1, Leleu X1, Caillot D1, et al. (2017) Lenalidomide, Bortezomib, and Dexamethasone with Transplantation for Myeloma. N Engl J Med 376: 1311-1320. Rajan AM1, Rajkumar SV2 (2016) Treatment of newly diagnosed myeloma: Bortezomib-based triplet. Semin Oncol 43: 700-702. Chakraborty R, Muchtar E, Kumar S, Buadi FK, Dingli D, et al. (2017) The impact of induction regimen on transplant outcome in newly diagnosed multiple myeloma in the era of novel agents. Bone Marrow Transplant 52: 34-40. Durie BG, Hoering A, Abidi MH, Rajkumar SV, Epstein J, et al. (2017) Bortezomib with lenalidomide and dexamethasone versus lenalidomide and dexamethasone alone in patients with newly diagnosed myeloma without intent for immediate autologous stem-cell transplant (SWOG S0777): a randomised, open-label, phase 3 trial. Lancet 389: 519-527. Thoennissen GB, Görlich D, Bacher U, Aufenberg T, Hüsken AC, et al. (2017) Autologous stem cell transplantation in multiple myeloma in the era of novel drug induction: a retrospective single-center analysis. Acta Haematol 137: 163-172. Palumbo A1, Cavallo F, Gay F, Di Raimondo F, Ben Yehuda D, et al. (2014) Autologous transplantation and maintenance therapy in multiple myeloma. N Engl J Med 371: 895-905. Gertz MA1, Dingli D2 (2014) How we manage autologous stem cell transplantation for patients with multiple myeloma. Blood 124: 882-890. Dimopoulos MA, Roussou M, Gkotzamanidou M, Nikitas N, Psimenou E, et al. (2013) The role of novel agents on the reversibility of renal impairment in newly diagnosed symptomatic patients with multiple myeloma. Leukemia. 27: 423-429. Wu Y1, Zhao RC, Tredget EE (2010) Concise review: bone marrow-derived stem/progenitor cells in cutaneous repair and regeneration. Stem Cells 28: 905-915. Nauta AJ1, Kruisselbrink AB, Lurvink E, Willemze R, Fibbe WE (2006) Mesenchymal stem cells inhibit generation and function of both CD34+-derived and monocyte-derived dendritic cells. J Immunol 177: 2080-2087. Murray IR, Péault B (2015) Q&A: Mesenchymal stem cells - where do they come from and is it important? BMC Biol 13: 99. Baglio SR1, Pegtel DM, Baldini N (2012) Mesenchymal stem cell secreted vesicles provide novel opportunities in (stem) cell-free therapy. Front Physiol 3: 359. Mier PD, van den Hurk JJ (1975) Lysosomal hydrolases of the epidermis. I. Glycosidases. Br J Dermatol 93: 1-10. Murakami M1, Horibe H, Iohara K, Hayashi Y, Osako Y, et al. (2013) The use of granulocyte-colony stimulating factor induced mobilization for isolation of dental pulp stem cells with high regenerative potential. Biomaterials 34: 9036-9047. Zhao K1, Liu Q2 (2016) The clinical application of mesenchymal stromal cells in hematopoietic stem cell transplantation. J Hematol Oncol 9: 46. Hass R, Kasper C, Böhm S, Jacobs R (2011) Different populations and sources of human mesenchymal stem cells (MSC): A comparison of adult and neonatal tissue-derived MSC. Cell Commun Signal 9: 12. Tondreau T, Meuleman N, Delforge A, Dejeneffe M, Leroy R, et al. (2005) Mesenchymal stem cells derived from CD133-positive cells in mobilized peripheral blood and cord blood: proliferation, Oct4 expression, and plasticity. Stem Cells 23: 1105-1112. Wexler SA, Donaldson C, Denning-Kendall P, Rice C, Bradley B, (2003) Adult bone marrow is a rich source of human mesenchymal 'stem' cells but umbilical cord and mobilized adult blood are not. Br J Haematol 121: 368-374. Pelus LM1 (2008) Peripheral blood stem cell mobilization: new regimens, new cells, where do we stand. Curr Opin Hematol 15: 285-292. Lin CS1, Ning H, Lin G, Lue TF (2012) Is CD34 truly a negative marker for mesenchymal stromal cells? Cytotherapy 14: 1159-1163. Tatsumi K, Otani H, Sato D, Enoki C, Iwasaka T, et al. (2008) Granulocyte-colony stimulating factor increases donor mesenchymal stem cells in bone marrow and their mobilization into peripheral circulation but does not repair dystrophic heart after bone marrow transplantation. Circ J 72: 1351-1338. Bonab MM, Alimoghaddam K, Talebian F, Ghaffari SH, Ghavamzadeh A, (2005) In Search of mesenchymal stem cells: bone marrow, cord blood, or peripheral blood. Int J Hematol Oncol Bone Marrow Transplant 2: 17. Lv FJ1, Tuan RS, Cheung KM, Leung VY (2014) Concise review: the surface markers and identity of human mesenchymal stem cells. Stem Cells 32: 1408-1419. Kundrotas G (2012) Surface markers distinguishing mesenchymal stem cells from fibroblasts. Acta Med Litu 19: 75–79. Dominici M, Le Blanc K, Mueller I, Slaper-Cortenbach I, Marini F et al. (2006) Minimal criteria for defining multipotent mesenchymal stromal cells. The International Society for Cellular Therapy position statement. Cytotherapy. 8: 315-317. Sidney LE1, Branch MJ, Dunphy SE, Dua HS, Hopkinson A (2014) Concise review: evidence for CD34 as a common marker for diverse progenitors. Stem Cells 32: 1380-1389. Stzepourginski I, Nigro G, Jacob JM, Dulauroy S, Sansonetti PJ, (2017) CD34+ mesenchymal cells are a major component of the intestinal stem cells niche at homeostasis and after injury. Proc Natl Acad Sci U S A. 114: E506-E513. Eto H, Ishimine H, Kinoshita K, Watanabe-Susaki K, Kato H, et al. (2013) Characterization of human adipose tissue-resident hematopoietic cell populations reveals a novel macrophage subpopulation with CD34 expression and mesenchymal multipotency. Stem Cells Dev 22: 985-997. Alvarez P, Carrillo E, Vélez C, Hita-Contreras F, Martínez-Amat A, et al. (2013) Regulatory systems in bone marrow for hematopoietic stem/progenitor cells mobilization and homing. Biomed Res Int 2013: 312656. Salvino MA, Ruiz J (2016) Hematopoietic progenitor cell mobilization for autologous transplantation – a literature review. Rev Bras Hematol Hemoter 38: 28-36. Ria R, Vacca A (2014) Peripheral blood progenitor cells mobilization in patients with multiple myeloma. J Stem Cell Res Ther 4: 8. 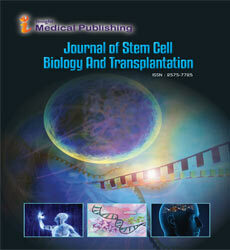 Al-Anazi KA1 (2012) Autologous Hematopoietic Stem Cell Transplantation for Multiple Myeloma without Cryopreservation. Bone Marrow Res 2012: 917361. Duong HK, Savani BN, Copelan E, Devine S, Costa LJ, et al. (2014) Peripheral blood progenitor cell mobilization for autologous and allogeneic hematopoietic cell transplantation guidelines from the American Society for Blood and Marrow Transplantation. Biol Blood Marrow Transplant 20: 1262-1273. Hoogduijn MJ, Verstegen MM, Engela AU, Korevaar SS, Roemeling-van Rhijn M, et al. (2014) No evidence for circulating mesenchymal stem cells in patients with organ injury. Stem Cells Dev 23: 2328-2335. Rochefort GY1, Delorme B, Lopez A, Hérault O, Bonnet P, et al. (2006) Multipotential mesenchymal stem cells are mobilized into peripheral blood by hypoxia. Stem Cells 24: 2202-2208. Villaron EM, Almeida J, López-Holgado N, Alcoceba M, Sánchez-Abarca LI, et al. (2004) Mesenchymal stem cells are present in peripheral blood and can engraft after allogeneic hematopoietic stem cell transplantation. Haematologica 89: 1421-1427. Lazarus HM, Haynesworth SE, Gerson SL, Caplan AI (2009) Human bone marrow-derived mesenchymal (stromal) progenitor cells (MPCs) cannot be recovered from peripheral blood progenitor cell collections. J Hematother 6: 447-455. Da-Silva LM, Chagastelles Pc, Nardi Nb (2006) Mesenchymal Stem Cells Reside In Virtually All Post-Natal Organs And Tissues. J Cell Sci 119: 2204-2213. Kassis I, Zangi L, Rivkin R, Levdansky L, Samuel S, et al. (2006) Isolation of mesenchymal stem cells from G-CSF-mobilized human peripheral blood using fibrin microbeads. Bone Marrow Transplant 37: 967-976. Lund TC, Tolar J, Orchard PJ (2008) Granulocyte colony-stimulating factor mobilized CFU-F can be found in the peripheral blood but have limited expansion potential. Haematologica 93: 908-912. Gilevich IV1, Fedorenko TV2, Pashkova IA2, Porkhanov VA2, Chekhonin VP1 (2017) Effects of Growth Factors on Mobilization of Mesenchymal Stem Cells. Bull Exp Biol Med 162: 684-686. Xu L, Li G (2014) Circulating mesenchymal stem cells and their clinical implications. J Orth Transl 2: 1-7. Koning JJ1, Kooij G, de Vries HE, Nolte MA, Mebius RE (2013) Mesenchymal stem cells are mobilized from the bone marrow during inflammation. Front Immunol 4: 49. Fadini GP, Fiala M, Cappellari R, Danna M, Park S, et al. (2015) Diabetes limits stem cell mobilization following G-CSF but not plerixafor. Diabetes 64: 2969-2277. Ferraro F1, Lymperi S, Méndez-Ferrer S, Saez B, Spencer JA, et al. (2011) Diabetes impairs hematopoietic stem cell mobilization by altering niche function. Sci Transl Med 3: 104ra101. Bendall LJ, Bradstock KF (2014) G-CSF: From granulopoietic stimulant to bone marrow stem cell mobilizing agent. Cytokine Growth Factor Rev. 25: 355-367. Ben Nasr M1, Fiorina P2 (2016) CXCR4 antagonism overcomes diabetic stem cell mobilopathy. Atherosclerosis 251: 512-513. Lu D, Chen B, Liang Z, Deng W, Jiang Y, et al. (2011) Comparison of bone marrow mesenchymal stem cells with bone marrow-derived mononuclear cells for treatment of diabetic critical limb ischemia and foot ulcer: A double-blind, randomized, controlled trial. Diabetes Res Clin Pract 92: 26-36. Alvarez-Viejo M, Menendez-Menendez Y, Blanco-Gelaz MA, Ferrero-Gutierrez A, Fernandez-Rodriguez MA, et al. (2013) Quantifying mesenchymal stem cells in the mononuclear cell fraction of bone marrow samples obtained for cell therapy. Transplant Proc 45: 434-439. Fuji S, Rovó A, Ohashi K, Griffith M, Einsele H, et al. (2016) How do I manage hyperglycemia/post-transplant diabetes mellitus after allogeneic HSCT. Bone Marrow Transplant 51: 1041-1049. Hammer MJ, Casper C, Gooley TA, O'Donnell PV, Boeckh M, (2009) The contribution of malglycemia to mortality among allogeneic hematopoietic cell transplant recipients. Biol Blood Marrow Transplant 15: 344-351. Kawajiri A, Fuji S, Tanaka Y, Kono C, Hirakawa T, et al. (2017) Clinical impact of hyperglycemia on days 0-7 after allogeneic stem cell transplantation. Bone Marrow Transplant. Fuji S, Löffler J, Savani BN, Einsele H, Kapp M (2017) Hyperglycemia as a possible risk factor for mold infections-the potential preventative role of intensified glucose control in allogeneic hematopoietic stem cell transplantation. Bone Marrow Transplant 52: 657-662. Braiteh F, Hymes SR, Giralt SA, Jones R (2008) Complete remission of psoriasis after autologous hematopoietic stem-cell transplantation for multiple myeloma. J Clin Oncol 26: 4511-4513. Woods AC, Mant MJ (2006) Amelioration of severe psoriasis with psoriatic arthritis for 20 years after allogeneic haematopoietic stem cell transplantation. Ann Rheum Dis 65: 697. Adkins DR, Abidi MH, Brown RA, Khoury H, Goodnough LT, et al. (2000) Resolution of psoriasis after allogeneic bone marrow transplantation for chronic myelogenous leukemia: late complications of therapy. Bone Marrow Transplant 26: 1239-1241. Cooley HM, Snowden JA, Grigg AP, Wicks IP (1997) Outcome of rheumatoid arthritis and psoriasis following autologous stem cell transplantation for hematologic malignancy. Arthritis Rheum. 40: 1712-1715. Sullivan KM, Muraro P, Tyndall A (2010) Hematopoietic cell transplantation for autoimmune disease: updates from Europe and the United States. Biol Blood Marrow Transplant. 16: 48-56. Swart JF1, Delemarre EM2, van Wijk F2, Boelens JJ1,2, et al. (2017) Haematopoietic stem cell transplantation for autoimmune diseases. Nat Rev Rheumatol 13: 244-256. Del Papa N, Onida F, Zaccara E, Saporiti G, Maglione W, et al. (2017) Autologous hematopoietic stem cell transplantation has better outcomes than conventional therapies in patients with rapidly progressive systemic sclerosis. Bone Marrow Transplant 52: 53-58. Cheng SK, Park EY, Pehar A, Rooney AC, Gallicano GI (2016) Current progress of human trials using stem cell therapy as a treatment for diabetes mellitus. Am J Stem Cells 5: 74-86. Luzi L, Benedini S, Caumo A, Terruzzi I (2015) Overview of cellular transplantation in diabetes mellitus: focus on the metabolic outcome. Adv Endocrinol 2015: 967562. El-Badawy A, El-Badri N (2016) Clinical efficacy of stem cell therapy for diabetes mellitus: a meta-analysis. PLoS One. 11: e0151938. Chhabra P1, Brayman KL (2013) Stem cell therapy to cure type 1 diabetes: from hype to hope. Stem Cells Transl Med 2: 328-336. Raffaele M1, Li Volti G2, Barbagallo IA1, Vanella L1 (2016) Therapeutic Efficacy of Stem Cells Transplantation in Diabetes: Role of Heme Oxygenase. Front Cell Dev Biol 4: 80. Wang L1, Zhao S, Mao H, Zhou L, Wang ZJ, et al. (2011) Autologous bone marrow stem cell transplantation for the treatment of type 2 diabetes mellitus. Chin Med J (Engl) 124: 3622-3628. Voltarelli JC1, Couri CE (2009) Stem cell transplantation for type 1 diabetes mellitus. Diabetol Metab Syndr 1: 4. Voltarelli JC1, Couri CE1, Oliveira MC1, Moraes DA1, Stracieri AB1, et al. (2011) Stem cell therapy for diabetes mellitus. Kidney Int Suppl (2011) 1: 94-98. Voltarelli JC1, Couri CE, Stracieri AB, Oliveira MC, Moraes DA, et al. (2008) Autologous hematopoietic stem cell transplantation for type 1 diabetes. Ann N Y Acad Sci 1150: 220-229. Cantú-Rodríguez OG, Lavalle-González F, Herrera-Rojas MÁ, Jaime-Pérez JC, Hawing-Zárate JÁ, et al. (2016) Long-term insulin independence in type 1 diabetes mellitus using a simplified autologous stem cell transplant. J Clin Endocrinol Metab 101: 2141-2148. Zhao Y, Jiang Z, Zhao T, Ye M, Hu C, et al. (2012) Reversal of type 1 diabetes via islet ß cell regeneration following immune modulation by cord blood-derived multipotent stem cells. BMC Med 10:3. Bretzel RG (2003) Pancreatic islet and stem cell transplantation in diabetes mellitus: results and perspectives. In: Tissue engineering, stem cells and gene therapy. Edited by Elcin YM. Kluwer Academic, Plenum Publishers. Adv Exp Med Biol 534: 69-96. Westenfelder C, Gooch A, Hu Z, Ahlstrom J, Zhang P (2017) Durable control of autoimmune diabetes in mice achieved by intraperitoneal transplantation of "neo-islets," three-dimensional aggregates of allogeneic islet and "mesenchymal stem cells". Stem Cells Transl Med. 2017 May 3. doi: 10.1002/sctm.17-0005. [Epub ahead of printn diagnosis, risk-stratification, and management. Am J Hematol 91: 719-934.